At the AGM on 2 December, Carnegie Wave Power (CWP) shareholders voted overwhelmingly to change the Company name to Carnegie Clean Energy (CCE) in recognition of Carnegie’s broadening focus on clean energy. Carnegie is an interesting company. To begin with, it is an Australian company, quoted on the ASX, not huge – it has a market cap of about eighty million $ Aus – but not insignificant. 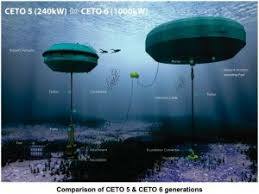 As you would expect, its main business is wave energy, which globally has been a tough sell. There are serious technical problems to overcome and a number of wave energy companies have gone bust. Some estimates put wave research and development fifteen, maybe even twenty-five, years behind that of solar and wind. But wave energy technology seems to be viewed somewhat differently in Australia, where more than 80 per cent of the population live on the coast. As such, wave energy technology has benefited from generally positive support throughout the country, even when other technologies such as solar and wind were dismissed or even criticized for taking government subsidies. And the planners do not seem to lack confidence in wave power. The Australian Renewable Energy Agency envisages that twenty per cent of Australia’s electricity will come from wave energy by 2020, though in the face of falling demand over the past five years, the renewables target originally fixed of 41,000 gigawatt hours constitutes a good deal more than twenty per cent of likely needs in 2020. In this relatively benign environment, Carnegie has been developing its CETO wave energy technology for over 10 years, with the aid of government grants. 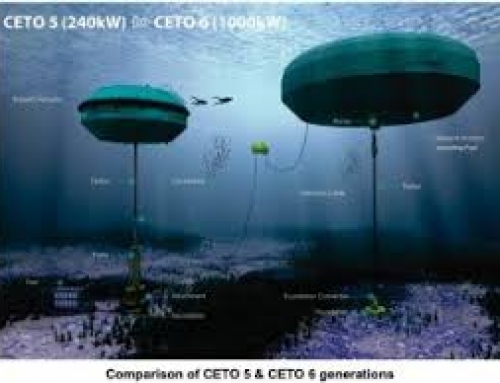 Crucially, the CETO system is different from other wave energy devices as it operates under water, where it is safer from large storms and invisible from the shore. Carnegie eventually successfully deployed and operated the world’s first grid connected array of three CETO 5 units at the Australian Navy base at Garden Island in Western Australia. The current challenge is to develop a follow-on pre-commercial project for 1 MW using the next generation of CETO technology, the much improved CETO 6 Unit. If successful, this will be followed by a second phase with a larger, commercial, array (10 to 15 MW), ideally competitive with off-shore wind. The first phase will cost about £15 million and will benefit from a grant of £9.6 million from the ERDF. For it is to be undertaken in the UK, at Wave Hub, the centre for wave energy development, located approximately 10 nautical miles (16km) off Hayle, on the north coast of Cornwall. Why Cornwall? Because as a result of the spin of the Earth (the “Coriolis effect”) it is often the western coasts of countries with an ocean-frontage which offer the best locations for wave energy (think Scotland). The project will also include engagement with, and coordination of, a suitable supply chain for the construction and operational phase. The Wave Hub infrastructure will thus be important because it will allow Carnegie to hook up their CETO array to the subsea electrical cables already installed and the existing grid connection.